A new article from Pro Sport announces more bad news (and brief good news) for Russian gymnastics. Alexander Kiryashov has said that Liudmila Grebenkova-Ezhova will not compete in the World Cup Final in Madrid in December. Why? Ironically, a knee injury. 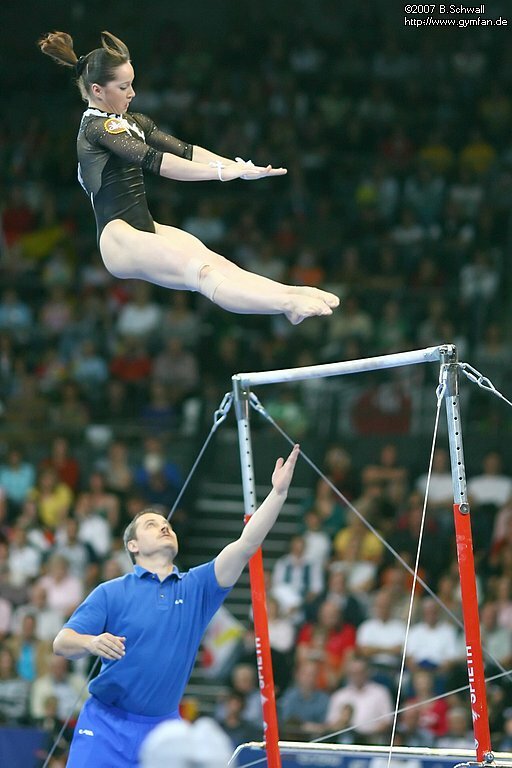 Grebenkova was qualified in 13th place on beam. This leaves the Russians with few people for the WCF — Anna Pavlova (qualified on beam and vault) is out with torn knee ligaments suffered at the DTB Cup earlier this month; and Ksenia Semenova (qualified on bars and beam) has an elbow injury. Elena Zamolodchikova (qualified on vault and floor) is back — she was at the DTB Cup — but not performing at the highest level. According to this same article, Lozhecko has experienced “psychological problems” after not being selected for the Olympic team. But things are going better, according to Kiryashov. She has been training again at Round Lake since November 6th and her chances of attending the WCF are “more realistic” now that Grebenkova cannot attend. For the record, Semenova is ranked 23rd on beam, with Ksenia Afanasyeva 26th. Other than Zamolodchikova and Pavlova, the Russians have no one in the top thirty on vault. Irina Isayeva is the only Russian other than Semenova who is in the top thirty on bars. Zamolodchikova is ranked 14th on floor, with Ekaterina Kramarenko tied for 29th.